This weekend is turning out to be a bit of a telephony weekend, as I unpack more items from the stack of items donated by readers of the blog. This one is something I’m particularly fond of – the Anchor Automation Volksmodem 12 which is even older than the Netcomm SmartModem 2400SA I previously received. In this post, I will look at the history of the company (Anchor Automation), the Volksmodem 12 itself, take a peek under the case and demonstrate it for your enjoyment. In the late 70s, dial-in bulletin-board systems (BBS) began to pop up, as the Hayes Smartmodem allowed for automated unattended placing of and answering data calls and computer visionaries started to write software to take advantage of these capabilities. This rapidly resulted in the development and growth of the modem business, as hosts felt the need to expand capacity through adding more lines and modems, and users began to be accustomed to the services, information and interactivity that BBS services could provide and thus purchased modems to connect their own microcomputers and PCs. Unlike the internet, BBSes were more like a forum that was almost entirely text based where users interacted through a text terminal emulator to add postings, send messages, read news and later, even automate the exchange of files and play rudimentary games. These would usually operate in isolation, although some did allow some inter-BBS passing of messages or dial-through if you had the necessary permissions. Born a little late to join the BBS era, it seems the early 80s was a boom period, as early 300 baud modems gave way to faster 1200 baud and then 2400 baud modems. Compatibility was always a concern, as modems were very expensive at the time and users were reluctant to upgrade or purchase something that wouldn’t give them a benefit for the servers they were dialling into. The Hayes Smartmodem 1200 retailed for US$699 in 1982 (equivalent to US$1,830.99 in 2019) which was rather steep. Anchor Automation was a company that saw this as an opportunity to be a leader and introduce more cost-effective modems with the features and reliability demanded by users. The Volksmodem 12 was one of their answers – from this advertisement in InfoWorld in March 1985, they were retailing a comparable modem for just US$299 (equivalent to US$702.42 in 2019) with an industry-leading 5-year warranty. A look at another advertisement from InfoWorld in November 1984, Anchor Automation were pitching the Volksmodem 12 as “Porsche performance, Volksmodem price.” It seems the name, Volksmodem is inspired from Volkswagen – in essence, a modem for the people. Indeed, the Volksmodem 12 was not their first product – the original Volksmodem was a 300bps modem, with the 12 being a “drop in upgrade” according to Computerworld October 1984. It would not be their last product either, with a higher end Signalman Express (300/1200bps) modem advertised with the tagline “Has the high cost of modems left your computer speechless? Smart Modem, Smart Price.”, the Signalman Mark XII (110/300/1200bps) modem advertised as “the Smart-Money Modem.”, Signalman LIGHTNINGi (2400bps), Anchor 1200-I/E and 2400-I/E, 24E5 and 2400PS. While their modems were cheaper than the competition, they were noted as having a few quirks, lower levels of FCC certification and rather average performance. It would seem that in a growing market, Anchor Automation would be doing well, however, it seems that they were in decline since 1985 and were bought by PerfectData for $250,000 in a foreclosure sale in 1991. However, it seems that PerfectData didn’t have much of a strategy or direction, having a strong appetite for acquisitions with few plans. In 1995, they discontinued modem operations as their rivals produced lower-priced products with greater features, with the company being on the brink of collapse in 1998 when it pitched itself for acquisition. Digging further, it seems that PerfectData did make it to 2005 where they were acquired by Sona Mobile Inc. in a reverse merger, and in 2009, it seems Sona Mobile Holdings Corp. (SNMBQ) filed for liquidation in 2009. The Volksmodem 12 has a rather plain, “brick” like monolithic appearance. Featuring a slightly yellowed beige exterior, it has a labelled front panel area with the branding clearly visible. The only user control is an on-off slide switch, with two LEDs for feedback indicating “high speed” (1200bps) and carrier detect. The modem comes with a grey fixed line cord terminating in an Australian 605 plug. This modem is likely to be from around 1986, so it’s probably something that belongs in a museum … actually – the Computer History Museum has this one and a Volks 6420. The edges of the case are chamfered, but the sides of the case are enclosed with no ventilation holes. From the rear, the line cord enters on the left cut-out with some space on the underneath. The right cut-out is patched over, seemingly modified from the original design which may have had two modular jacks. In the centre is a standard 2.1mm inner tip barrel jack for 12V DC input, positive centre. There is a 5-pin DIN data socket. A four-position DIP switch is mounted behind the hole on the right, with two switches visible for adjustment – I did not determine their function. Luckily for me, a cable was included in the bundle, but the DB25 end has the wrong gender for fitting into an IBM-PC serial port. As a result, I had to use some creative use of a double-headed null-modem cable, plugging in the DB25 into the same short-end as a DE9 so I could get it connected to a modern USB-to-Serial adapter. Luckily, it worked – even with the tarnish on the DIN brass pins. The rear of the modem has four positions for feet which have since been lost – probably a good thing as most rubber feet disintegrate into “goo” sooner or later. This particular modem is Serial Number 566458 and seems to have been distributed by R.F. Computer Communication Pty Ltd. Unfortunately, this company too seems to have disappeared, according to the ASIC Commonwealth of Australia Gazette issued 10th May 1999, the company with ACN 006 279 189 was to be deregistered within two months of publication. I suspect they may have been responsible for any modifications to bring them into telecom authorisation for use in Australia. 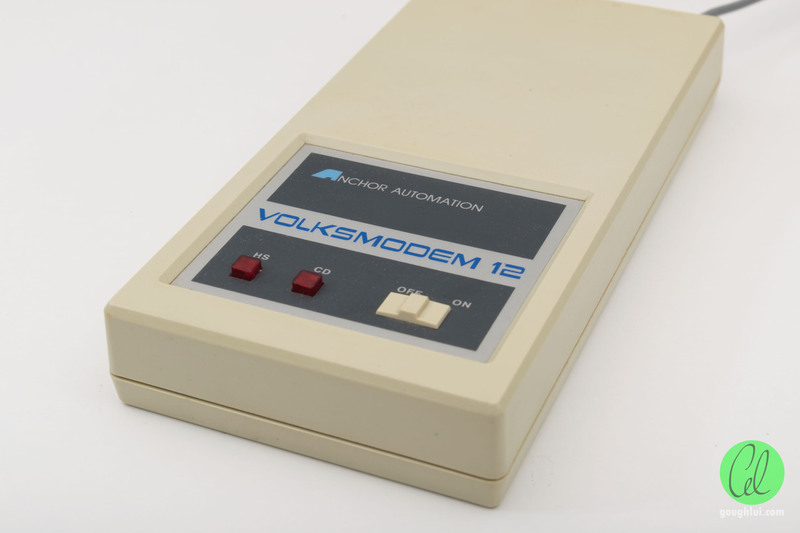 It seems the Volksmodem 12 may have been a little prescient – being a low-cost modem it uses a screwless design. That was not expected. The two halves of the case secure together by six friction-fit studs which have some silicone adhesive on them. As the adhesive had worn, opening the modem was as simple as prying the two halves apart under finger pressure. A look inside shows a fairly neat double-sided PCB with green solder resist and white silkscreen. Marked Anchor Automation Inc. Assy 00672 REV, the chips on the board are dated from 1984 through to 1986. There is even a friendly LM317T and LM7805 linear voltage regulator we are quite familiar with. The brains of the modem is a Hitachi HD6301V1P 8-bit HD6801-compatible microcontroller with 4kB ROM, 128 byte RAM. The heart of the modem appears to be a Motorola MC14412 Universal Low-Speed Modem, Exar XR2120CP PSK Modem Filter and an Exar XR2209CP Voltage Controlled Oscillator. These are supported by a number of regular discrete logic and op-amps including MC1405x series Analog Multiplexer/Demultiplexers and an NE571 Compander. 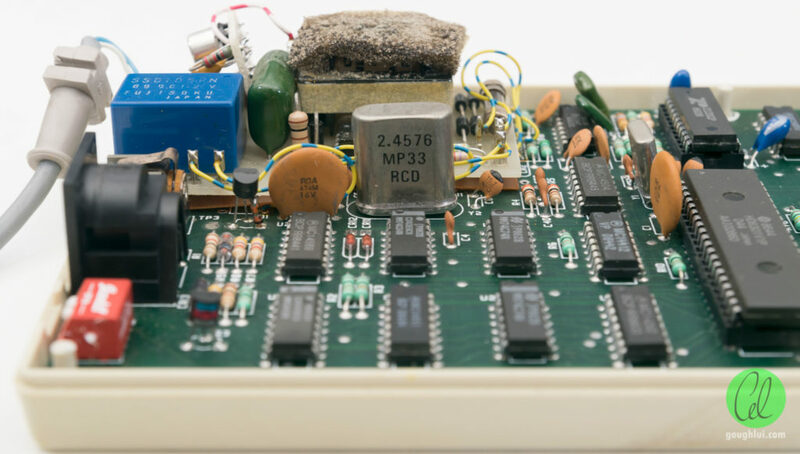 The neatness, however, is broken by an add-on PCB that contains the phone line interface, patched into the main-board with a number of thin insulated wires. The timing reference for the serial port seems to be a rather large 2.4576MHz crystal. There is a smaller 4MHz crystal nearby as well. We can see the only things truly proud of the PCB are the two LEDs and the arm of the power switch. There also seems to be a trimpot which may adjust the carrier frequency of the modem. 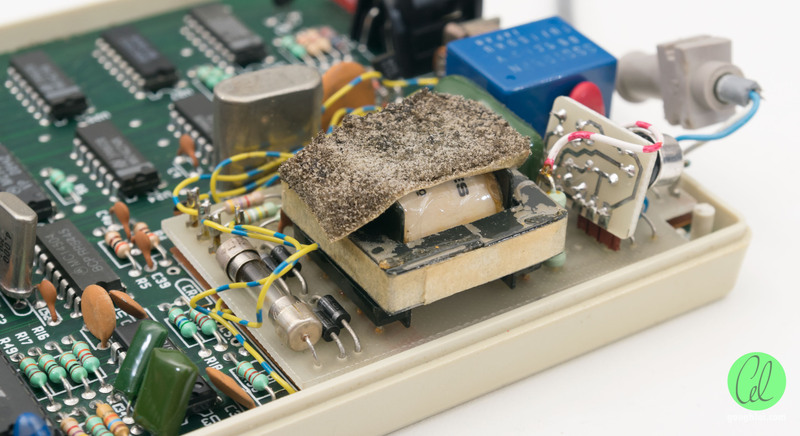 A closer look at the line interface shows it is a very “hefty” old design using a traditional line hybrid transformer, relay for line switching and soldered cartridge fuse for protection. A small bit of foam which has since rotted away helps keep the heavy transformer from rattling too much inside the case. We can see that when the line interface PCB is lifted (as it is not firmly secured to the board), it is insulated from the main board with a piece of card. Underneath, there appears to be a PCB design for a line interface involving the use of modular jacks, just that none of it is populated and the wires are “patched in” to pads almost at random. I suspect that the design may have been suitable for another country (e.g. USA) but does not meet Australian telecommunication standards. It seems a rather old BFY50 NPN transistor in a metal can is also visible on a vertical mini PCB. 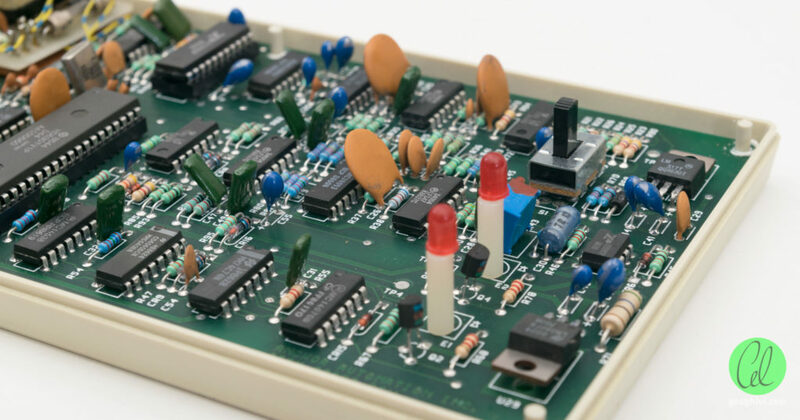 Being a two-sided PCB, there are traces on the rear as well, with the PCB dated Week 42 of 1986. The underside claims this board to be Revision C.
Getting the modem running wasn’t too difficult. The first step was to plug the serial cable into my dual-headed null-modem cable as a gender changer and DB-25 to DE-9 converter. The DE-9 portion went into an Atten (Prolific PL2303-based) USB to Serial adapter, to be plugged into my computer. The telephone 605 plug was plugged into an adapter to modular jack, which was connected to my Cisco SPA112 ATA connected to my home Raspbx. Power was supplied from my Manson HCS-3102 at 12V/500mA current limited. To have another modem to talk to, I chose my Rockwell/Conexant-based Netcomm Roadster II 56 Ultra SVD serial external modem as it was handy, attached to another USB to Serial adapter and attached to the second part of the SPA112 ATA. Traffic to and from the ATA was monitored by using port mirroring on my Netgear GS724T, captured by Wireshark and reassembled to produce the audio recordings. On the whole, it worked almost as expected as soon as it was powered up, provided you used either 1200bps or 300bps line rate (no baud rate conversion is performed). The modem operates synchronously with the serial port rate and some subtle quirks with the AT command set and responses are noticed (e.g. there is no ati that reports the name of the modem). Auto-answer after one ring seems to be the default as well. Negotiations with modern modems are problematic, as the Volksmodem 12 has a rather short time-out which causes the connection to be aborted before the other modem has fallen back to a matching modulation. Instead of harping on about the modem itself, I decided to let the modem speak for itself. I decided to write a short blog about the modem and transmit it modem-to-modem and make a video and audio recording of the result, calling on some ASCII art to bring back some nostalgia. Attempting a 1200bps link to run this experiment did not prove too difficult, except for the modem’s sensitivity to VoIP disruptions, causing the link to drop mid-transmission. This may also be because the modem may have lost its tuning slightly and thus more easily “loses” the carrier. In this case, text transmission was done from the Volksmodem 12 to the Netcomm with the call placed from the Volksmodem 12 to the Netcomm. A slight delay after connection is experienced as the modem waits to hear if the other end is going to use an error-correction mode, but times out. Some errors are visible, as is expected from non-error-corrected operation. A look at the audio alone shows the nature of 1200bps mode, which is a PSK-based transmission. As full-duplex echo-cancellation had not been perfected at this stage, the modem operates with two distinct carrier frequencies, one for each direction which result in data carriers which do not overlap. Thus, echoes from impedance mismatches from the outgoing transmission does not corrupt the incoming transmission. The audio file can be downloaded here. Attempting a 300bps version was much more challenging, as it did not seem possible to get the Volksmodem 12 to call the Netcomm and connect at 300bps reliably. Instead, the call had to be attempted in the reverse direction – from the Netcomm to the Volksmodem 12. As the Volksmodem had a 300bps serial link this time, it answered the call after the first ring at 300bps and a connection was made. Text transmission was made from the Netcomm to the Volksmodem, but despite numerous retries, it was not possible to sustain the link long enough to achieve the full transmission. Despite this, it is still a good result, as I didn’t expect something of this vintage to even be workable. It really illustrates the speed, or lack thereof, of 300bps transmission. Likewise, two separate carrier frequencies are used, with FSK being the mode of modulation. This particular mode has very harsh tones which could potentially cross-talk onto other lines, thus modem output power is probably limited and these modes were discouraged or even disabled in some later modems. The audio file can be downloaded here. 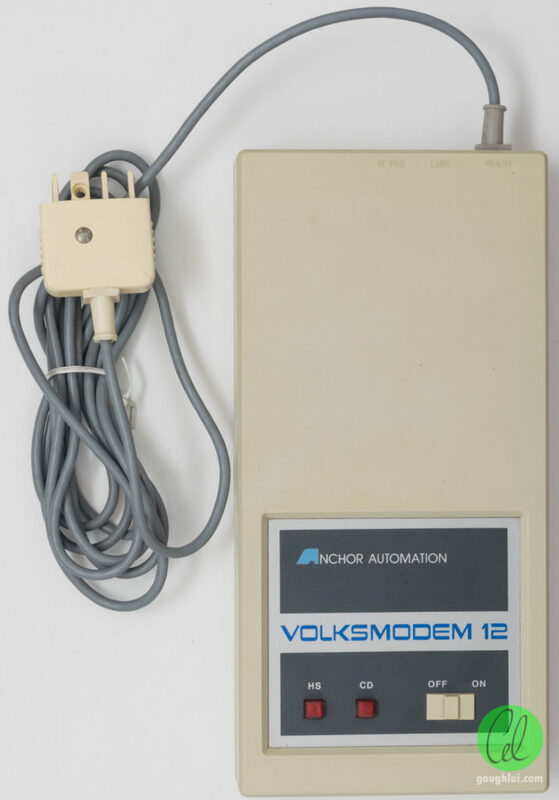 The Volksmodem 12, like the Volkswagen it was probably named after, was a cost-effective smartmodem from Anchor Automation that tried to offer the same features, reliability and compatibility with the Hayes SmartModems of the time. It looks rather basic and monolithic from the outside, with an odd-ball DIN connector for the serial data and modifications for Australian telecommunications compliance. This example was rather interesting as it had been well kept and still appears to function correctly even in 2019 (around 33 years old). It really shows us just how much bandwidth has increased over the years. That being said, the fortunes of Anchor Automation were not great, seemingly in decline despite having several products on the market in the 2400bps era and being sold to PerfectData, who themselves wound up the modem operations in 1995 under pressure from other competitors. Perhaps it would have been better to dig-out the Netcomm SmartModem 2400SA for the Volksmodem 12 to talk to as it would have been more “period-appropriate”, but I don’t have it to hand … so instead, it’s AT+MS (Modulation Select) to the rescue. Hello, this is Gough of goughlui.com! can be sent through it. ,.          .              ,. .                 .
|--| ;-. ,-. |-. ,-. ;-. |--| . . |-  ,-. ;-.-. ,-: |-  . ,-. ;-. seeing just RING on the terminal, the modem will pick up the line and answer. MIDI and older PC/AT and PC/XT keyboards. lack of error correction means a throughput of under 120 characters per second. about one and a half lines per second. Apologies for the typos, such as protocools and Xmoden … I typed it up quickly in Notepad without the benefit of spell checking – as you might have done in the old days especially in keyboard-to-keyboard conversation. 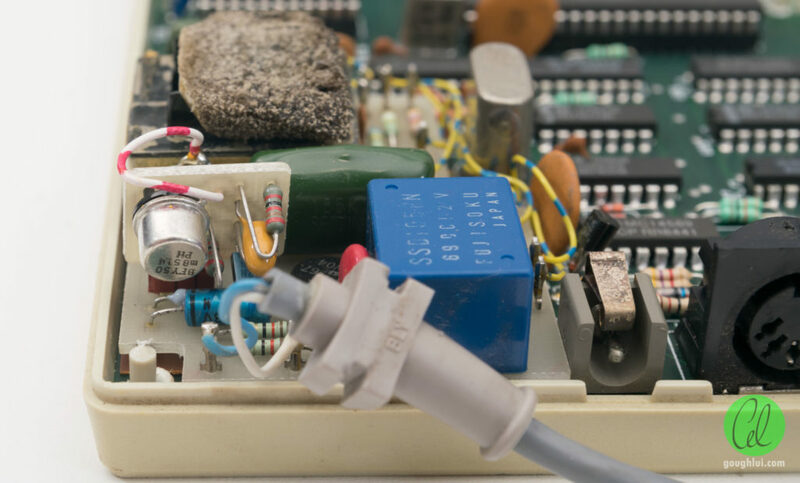 This entry was posted in Audio, Computing, Tech Flashback, Telecommunications and tagged modem, teardown, telephone, telephony, vintage hardware, vintage stuff. Bookmark the permalink.